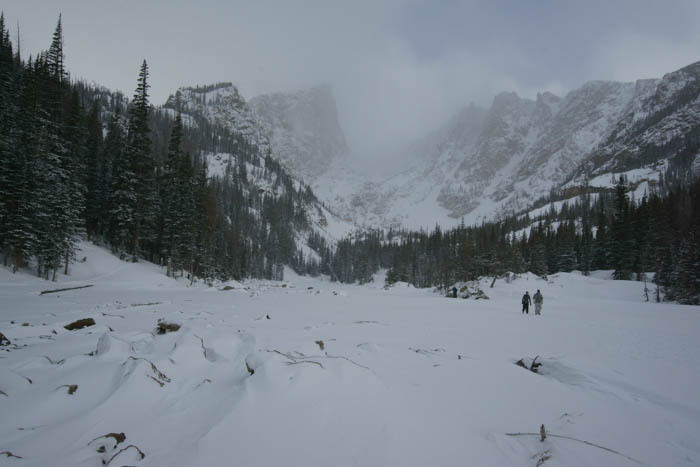 Most people probably wouldn’t even consider visiting Rocky Mountain National Park in winter. This jewel of the Rockies really shines in the summer months, when the snow is gone and the road over Milner Pass is open. But when winter arrives, the park changes, roads close, lakes freeze, and trails are buried in snow. It doesn’t seem like a great time to come to the park, but there’s still plenty to see and do, for those willing to brave some cold temperatures and icy roads. Rocky Mountain National Park is located northwest of Denver, Colorado, and west of the town of Estes Park. From Estes Park, you can take either US 34 or US 36 into the park. US 36 ends at the junction with US 34, shortly after entering the park, while US 34 continues over the Continental Divide as Trail Ridge Road. During winter and spring, US 34 is closed at Many Parks Curve. Combining US 34 and US 36 allows you to make a loop in and out of the park during winter and spring. Year-round access to Bear Lake is available by taking US 36 to Bear Lake Road, then turning south and traveling to the trailhead at the end of the road. Since I live in a warm state, I like to take a trip every January to see some snow. One week of freezing temperatures and white-out blizzards is enough to keep me happy throughout an entire year. At the beginning of this trip, I enjoyed a brief snowfall in Arches National Park, but the rest of the week had been snow-free. I hadn’t had enough. So, I made some last-minute changes to the end of my trip and chose a place where I knew I’d see plenty of white stuff. 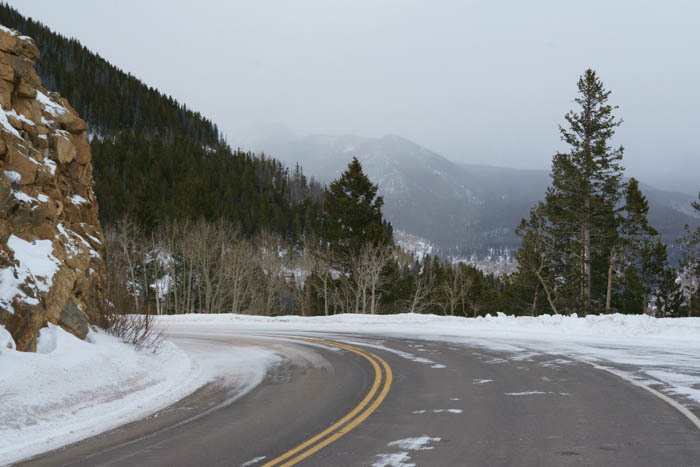 You won’t be able to drive over Milner Pass on Trail Ridge Road during winter or spring. And, you won’t be able to drive up Fall River Road, the old alternate to Trail Ridge Road. Unfortunately, much of the park’s great scenery is along these two roads. It also means you can’t access the west side of the park without a very long detour (which is okay — there isn’t a whole lot on the west side, anyhow). 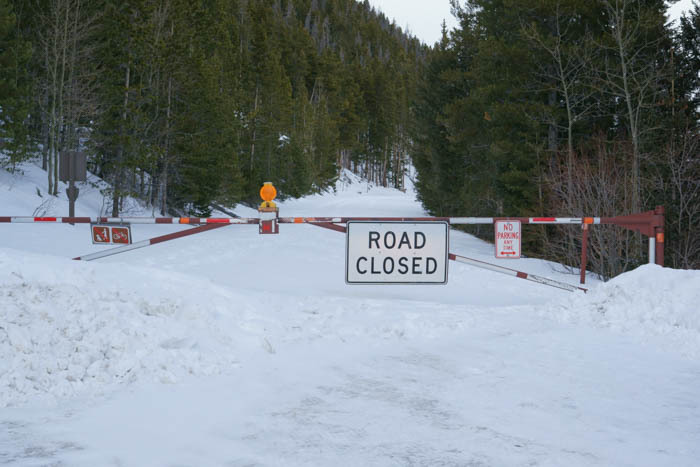 Trail Ridge Road closes at Many Parks Curve, and Fall River Road closes beyond Alluvial Fan. You can, however, enter the park on either US 36 or US 34, and exit on the other one, which allows you to make a loop through the park. Then, you can add a side-trip up to Many Parks Curve for some nice views of the frosted landscape. Just keep in mind, the roads may be slippery, and it might be snowy and blustery in the mountains, even when it’s sunny in Estes Park. This chain of lakes is at the end of Bear Lake Road, south of US 36. Bear Lake Road gains a lot of elevation on its way to the trailhead, and on the day I drove it (see the Drivelapse video below), the weather became progressively worse along the way. In the summer, the lakes are sparkling and blue, but in winter, they will be frozen solid. Most of the time, it should be safe to walk across them. The official summer trail goes around them, and you could attempt to go that way, but the most trampled path through the snow will likely take you straight across the lakes. 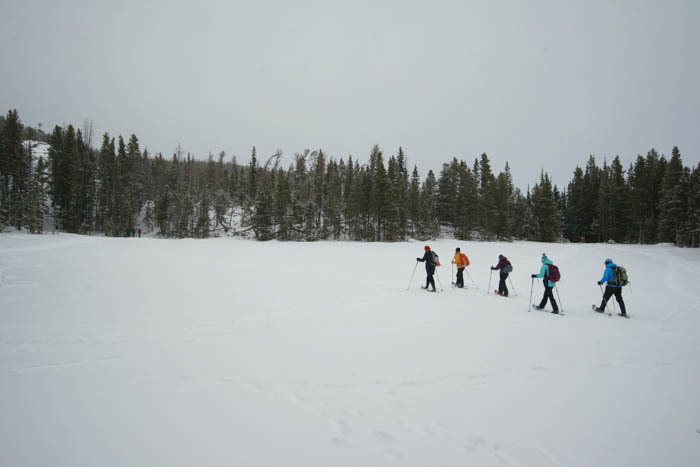 Crossing those frozen lakes was brutal, thanks to the howling wind and blowing snow. In between the lakes, though, it was a nice hike, with some beautiful mountain peaks peeking through the clouds. If you don’t mind hiking in cold weather, it’s a great experience. I was hoping to enjoy one more hike before leaving the park, and wrapping up my vacation. On the road to Bear Lake, there’s a trailhead for Alberta Falls. I decided to give it a try — but the truth is, it wasn’t very great. 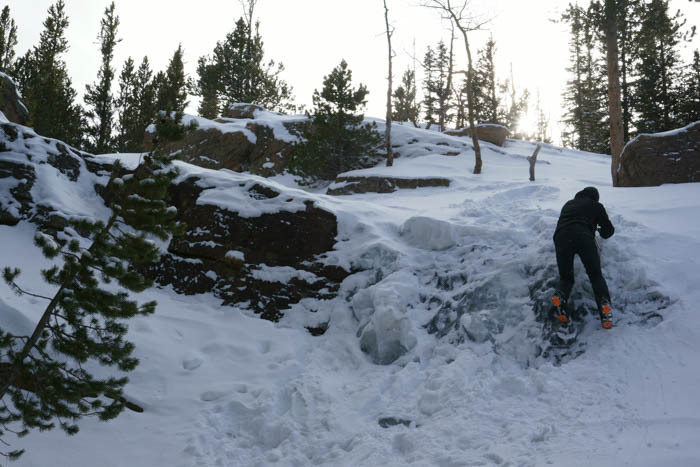 It’s a hike through the woods that leads to a small waterfall — which in January was frozen solid. When I arrived at the waterfall, another guy was practicing his ice-climbing skills on the face of the waterfall. There wasn’t much to see here, or along the way. As I backtracked from Bear Lake to US 36, the road skirted the edge of Moraine Park, giving me a wide-open view of a frosted valley with the Rocky Mountains in the distance. It’s a nice place to stop for a moment, and you may see some wildlife. 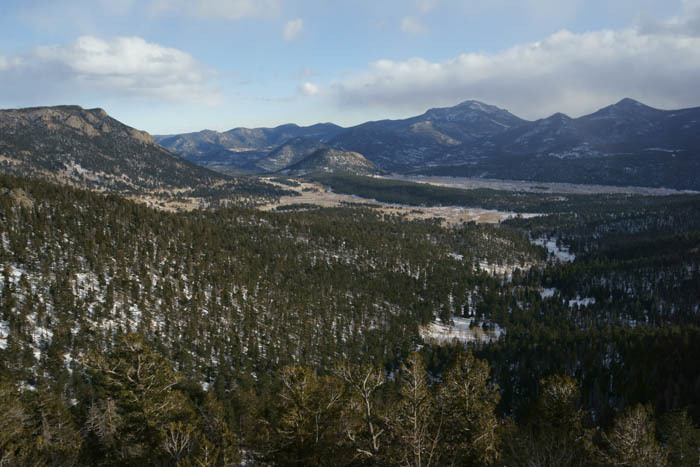 … I found a nice view of blue skies, looking towards Estes Park. It was chilly and a bit snowy at the viewpoint, which was similar to everything else I had experienced that day — the closer you are to the mountains, the worse the weather gets. If you don’t have your cross-country skis, you can’t go any further than Many Parks Curve. That’s a shame because my favorite view along Trail Ridge Road is at Rainbow Curve, which is the next viewpoint along the highway. But as you can see, things get pretty snowy, pretty fast, beyond the barrier. Don’t get the idea that the rest of the road is perfectly clear, either. 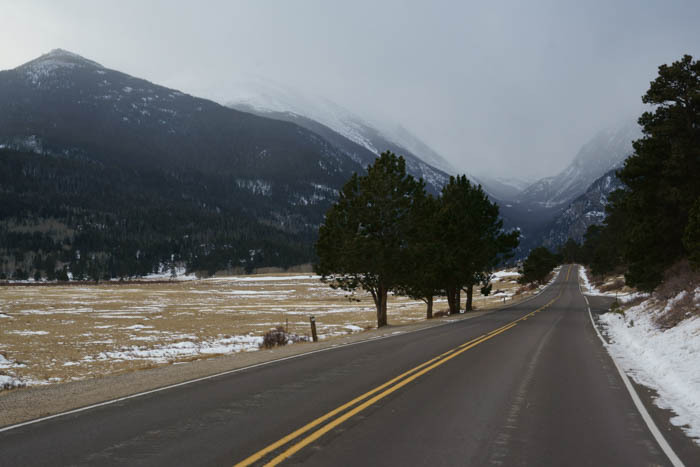 When visiting Rocky Mountain National Park in winter, you’ll drive over some slick spots that have been scraped but remain icy. These spots shouldn’t be a problem if you don’t panic, and don’t slam on your brakes — just keep rolling over them until you reach dry pavement again. After you backtrack down the hill from Many Parks Curve, turn onto US 34. You’ll pass by a few good viewpoints, but there’s not a whole lot to see. You’ll have the option of driving out to Alluvial Fan (on the paved portion of Fall River Road — beyond Alluvial Fan, it’s closed for the winter). You could get out of the car and check out Alluvial Fan, but I decided it was too cold and blustery for me. So, I drove on towards the Fall River entrance, exited the park, and spent a few more minutes in Estes Park before heading back to Denver. Don’t be afraid of some snow and chilly temperatures. 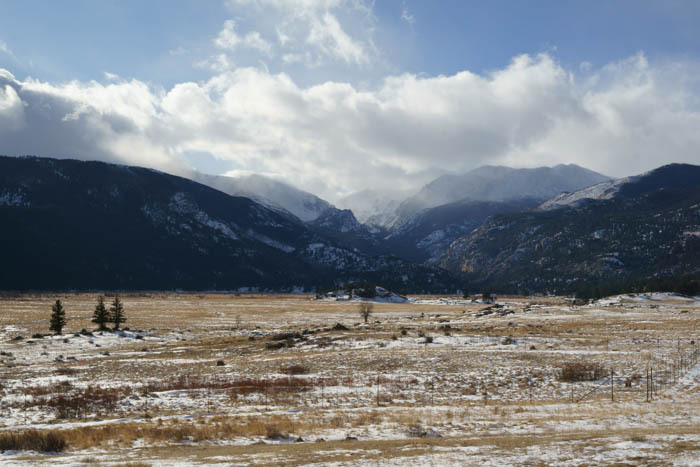 It’s great to see Rocky Mountain National Park in winter. 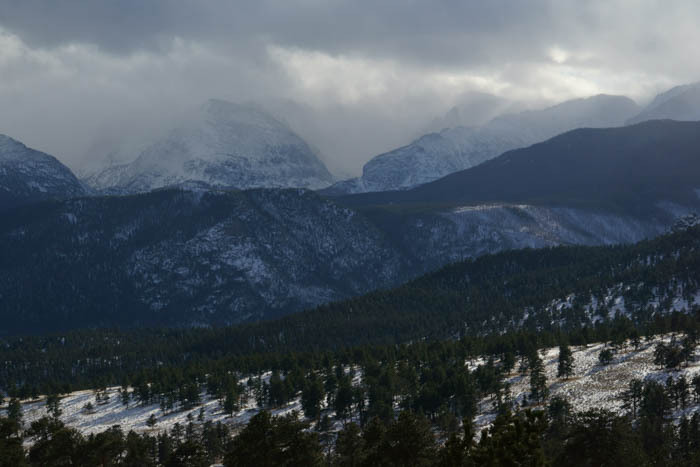 You won’t be able to get very far into the park, and you may have to navigate some slick roads, but you’ll get to see the Rockies covered in snow, in between storms. And, there are some great trails to hike, even in wintertime.